Rugby league football (or simply rugby league) is a full contact form of football, played with a prolate spheroid ball by two teams of thirteen players on a rectangular grass field. One of the two major codes of rugby football, over the decades following rugby league’s split from rugby union in 1895, its rules have been gradually changed, deliberately resulting in a faster and more open spectator sport. Frequently cited as the toughest and most physically demanding of any team sport in the world, the primary aim in rugby league is to carry or kick the ball towards the opponent’s goal line where points can be scored by grounding the ball; this is called a try. 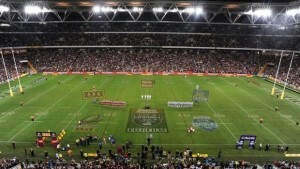 Rugby league is most prominent in Australia, England, New Zealand and Papua New Guinea, being the national sport in the latter. France and Wales also have professional clubs. The game is played at a semi-professional and amateur level in several other countries, such as Samoa, Tonga, Fiji, Ireland, Scotland, Russia, Lebanon, Germany, Japan, the United States, Malta and Jamaica.